The Howard Conservancy is hosting a free viewing party to watch the Perseid Meteor Shower this weekend. The Perseid Meteor Shower may come once a year, but it's a summer weekend activity you don't want to miss. Museums, restaurants, and concerts can be costly. But the Perseid Meteor shower provides free fun for everyone. Here's how to get the most out of the annual meteor shower this weekend. The Perseid Meteor will begin Saturday, August 11, run through the night on August 12, and end on August 13, according to Baltimore CBS Local. 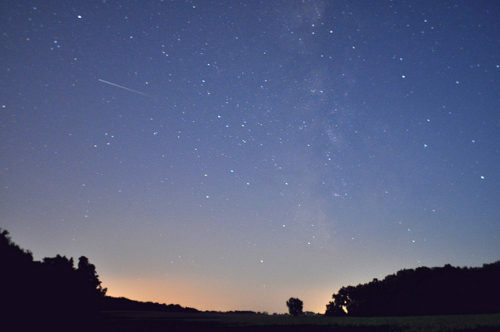 During its peak, watchers could see up to 60 meteors per hour, according to the Howard County Conservancy. The comet Swift-Tuttle, discovered in 1882, produces the shower, according to the conservancy. Though the shower runs annually from July 17 through August 24, this year's peak falls this very weekend. To best see the meteor shower, watch from a cozy, dark location after midnight. Meteors will appear near constellation Perseus, but can show up throughout the sky, according to the conservancy. Free viewing party on Saturday with high-powered telescopes. When's the last time you saw a meteor shower? What was it like? Let us know in the comments! Here are four weekend getaways we recommend in Virginia!